When I was staying in Bangalore with my daughter Nami, I have baked a number of cakes and muffins for her friends either for special occasions or just as a treat. Mostly the request would be for chocolate based cakes or muffins and nothing else. While most people love chocolate, Lekha was the only one in their group who didn’t like chocolate. Most of the time the majority won and Lekha would land up just tasting a wee bit of the cake to please me. 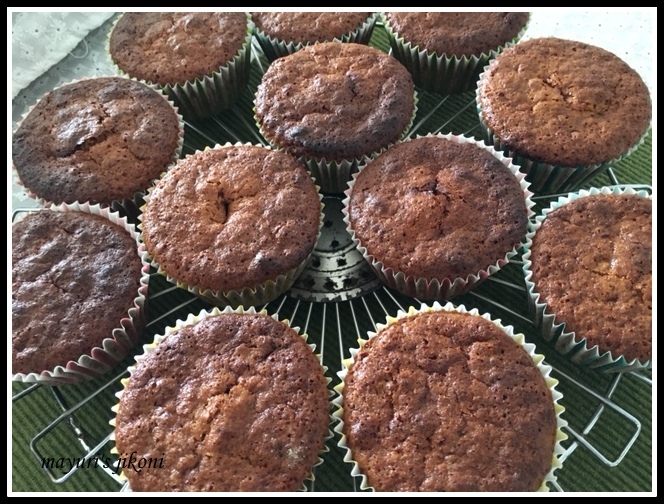 She loves banana cakes so this one is for you Lekha, wholemeal banana muffins. Twist Nami’s arm and get her to bake it for you or else you will have to wait till I visit Bangalore next. I actually have a better idea, follow the instructions and bake it yourself in Nami’s kitchen. So is that a plan? These muffins turned out pretty well, considering they are made from wholewheat flour. I loved the taste of honey and orange (I used fresh orange zest). Sieve the flour with the baking powder, soda bicarbonate and salt. Add nuts and mix well. Put sugar, honey, oil, banana puree, milk, yogurt and extract together in a bowl. Using a hand whisk, mix it together. Use a deep bowl as the mixture may splatter all over the place. Add the liquid mixture to the flour. Mix gently till the flour just becomes wet. Don’t over mix. Prepare the muffin tray or molds by putting paper cups in it. Spoon the batter ¾ of the way into the cups. Bake for 15 to 20 minutes till the tops are light golden in colour and the muffins are done. Push a skewer, knife or toothpick into the middle of the muffin. If it comes out clean, then they are done. If you want to make them into chocolate banana muffins then melt 100g of dark chocolate and let it cool. Add it to the liquid mixture just before you whisk it. Avoid adding the sugar if you use milk chocolate. Instead of yogurt you can use orange juice. The soda bicarbonate needs something acidic to react with to release the bubbles. Can use any nuts, dried fruits or seeds instead of walnuts. Sprinkle the top with sprinkles, oats or nuts before baking. When you grate the orange or lemon peel be careful not to grate the white part as it is bitter. Hubby dear loves muffins. I will make them for him. They are healthy and perfect for btreakfast.